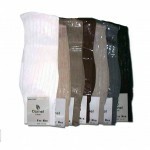 Home / Men / Mens Compression Socks, per doz. Mens Compression Socks are a specialized hosiery, designed to help prevent the occurrence of, and guard against further progression of venous disorders. 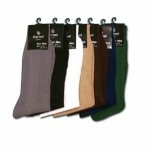 Category: Men, Men's Dress Socks, Men's Sport Socks. 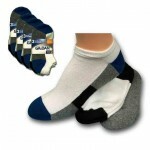 Tags: Cotton, Elastic, exceptional comfort, Extra Support, Medical Supliment, Multiple Colors, Spandex. Mens Compression Socks are unlike traditional dress or athletic socks, compression socks use stronger elastics to create significant pressure on the legs, ankles and feet. 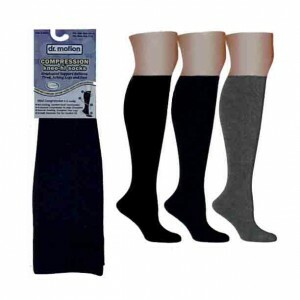 Compression socks are tightest at the ankles and gradually become less constrictive towards the knees. By compressing the surface veins, arteries and muscles, the circulating blood is forced through narrower circulatory channels. As a result, the arterial pressure is increased, which causes more blood to return to the heart and less blood to pool in the feet.